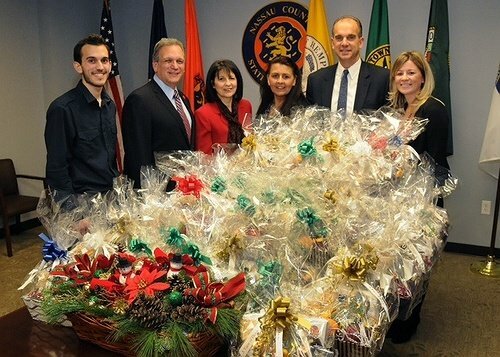 Nassau County Executive Edward P. Mangano thanked everyone who worked together this holiday season to put together and distribute baskets for Nassau County’s homebound seniors. Nassau County, NY - December 24, 2014 - Nassau County Executive Edward P. Mangano (2nd left) thanked everyone who worked together this holiday season to put together and distribute baskets for Nassau County’s homebound seniors. County Executive Mangano thanked Tim Fuger of North Bellmore’s “A Taste of Home” bakery who very generously donated all of the baked goods used to fill the baskets. Subject: LongIsland.com - Your Name sent you Article details of "Mangano Distributes Baskets for Homebound Seniors"